The Vital Sync™ monitoring and clinical decision support (CDS) solution integrates physiological information from bedside devices and transmits it to your hospital server. This single software platform can help you gain more value from your medical devices by providing you with the right information, at the right time, so you can provide the right patient care. And prevent the preventable. Whether you’re across the room, across the hospital, or across town, you’ll always be at your patients’ side. 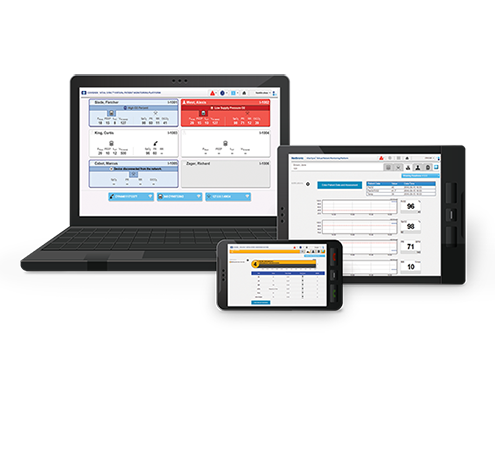 The Vital Sync™ virtual patient monitoring platform (VPMP) provides the software foundation for the Vital Sync™ monitoring and clinical decision support (CDS) solution. This single platform is designed to help you gain greater value from your medical devices so you can respond more proactively to your patients’ needs. The Vital Sync™ VPMP integrates information from bedside devices and transmits it to your hospital server. This software platform consolidates critical patient information and enables you to access it from wherever you are. The Vital Sync™ early warning score (EWS) app helps you realize the benefits of using an automated early warning system. 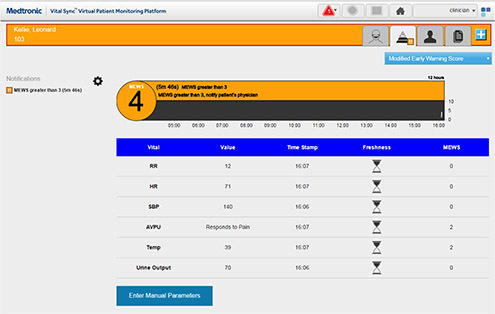 The app continuously monitors patient information from multiple bedside devices, EMRs, as well as data that has been manually entered, to automatically calculate an EWS based on your facility’s chosen algorithm. With the timely insights from the Vital Sync™ EWS app, you can know when the first signs of patient deterioration appear — so you can take the appropriate action. The Vital Sync™ weaning readiness and spontaneous breathing trial (SBT) monitoring app allows you to streamline and simplify the implementation of protocol-driven weaning. 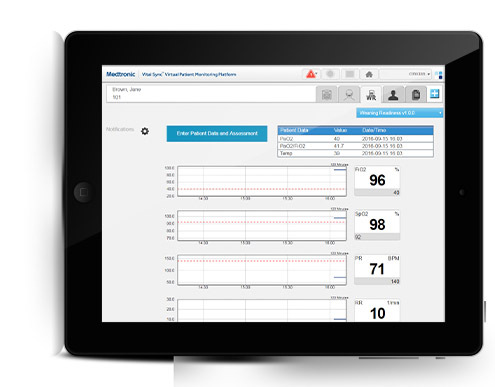 By continuously monitoring configurable physiologic variables — such as RR, VT, VE, heart rate, and blood pressure — the Vital Sync™ weaning readiness feature tracks your patient’s readiness to initiate an SBT based on AARC guidelines4 or your hospital's protocol and alerts you when the patient is ready to begin a weaning trial. Once you initiate an SBT, the Vital Sync™ SBT monitoring feature allows you to track the breath-by-breath progress of your patient through the trial — from wherever you are. 1. Barrett PM, Komatireddy R, Haaser S, et al. Comparison of 24-hour Holter monitoring with 14-day novel adhesive patch electrocardiographic monitoring. Am J Med. 2014;127(1):95 e11-97. 3. Medtronic, 2015. GMA-RMS Full Model Detail (MDT); RFP 2975 Final Dynamic Market Model (MDT); NCI Interviews and Analysis. Unpublished internal document. Navigant. 4. Evidence-Based Guidelines for Weaning and Discontinuing Ventilatory Support. A collective task force facilitated by the American College of Chest Physicians; the American Association for Respiratory Care; and the American College of Critical Care Medicine. Respir Care 2002;47(1):69-90.